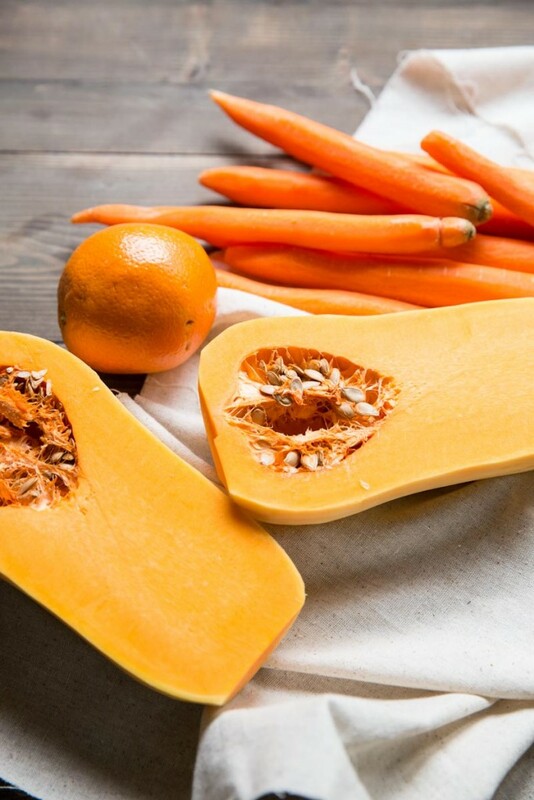 This Butternut Squash, Carrot, and Orange Soup is my latest greatest detox meal. It’s the time of year for a little cleansing. And I feel like I need this more than ever this year. Though we eat pretty healthy year around, the holidays hit us hard this year with tons of sweets along with sickness that kept us inside and less active. Now I’m ready to start my regular workouts again and eat more things like this. Isn’t it funny that when we’re more active we have more of a desire to eat healthy too. Besides a little food and exercise cleansing, I’ve also spent some time getting my mind refreshed for the new year. I always like to start the new year with a little time of solitude to think through what I want my year to be about. Last year my friend Haley challenged me to come up with a single word to guide my year and I found it to be a lovely way to keep focus throughout the year, helping guide my decisions and plans. This year I did the same. My word of the year for 2016 – JOY! There so much to this word and I look forward to digging in deep to learn the roots and etymology of the word. What I do know about joy, is that it is not something that can be mustered up but comes deep from within and it’s source can only be through the presence of God in my life. Though this year is already looking like one filled with transitions and change, I hope that I can still embody joyfulness despite my circumstances. About the recipe – this soup is an easy mixture of bright winter veggies cooked in veggie broth then pureed until velvet-y smooth. I like to top this soup with black rice, or as some call it, forbidden rice. 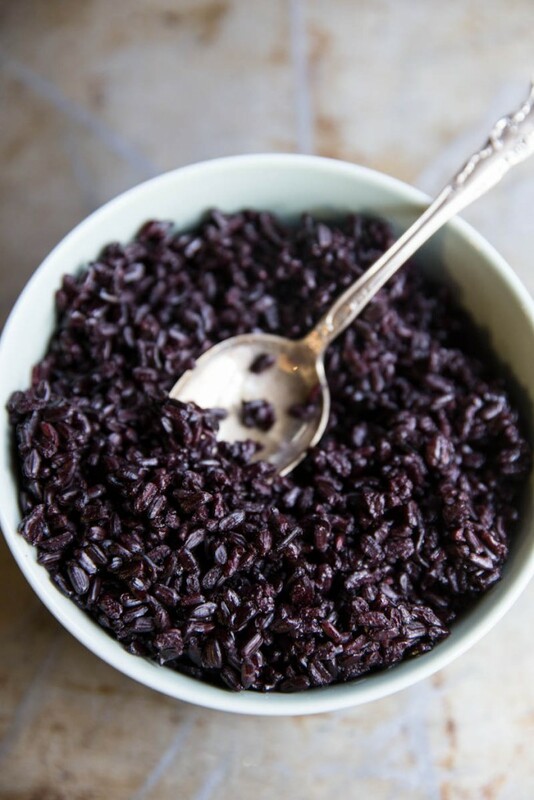 This rich black rice is filled with iron, vitamin E, and antioxidants (even more than blueberries). If you can’t find black rice at your local grocery store, feel free to swap it with brown rice, quinoa, or another cooked grain. Some other garnish ideas for this soup: chopped herbs, toasted seeds, and extra coconut milk. 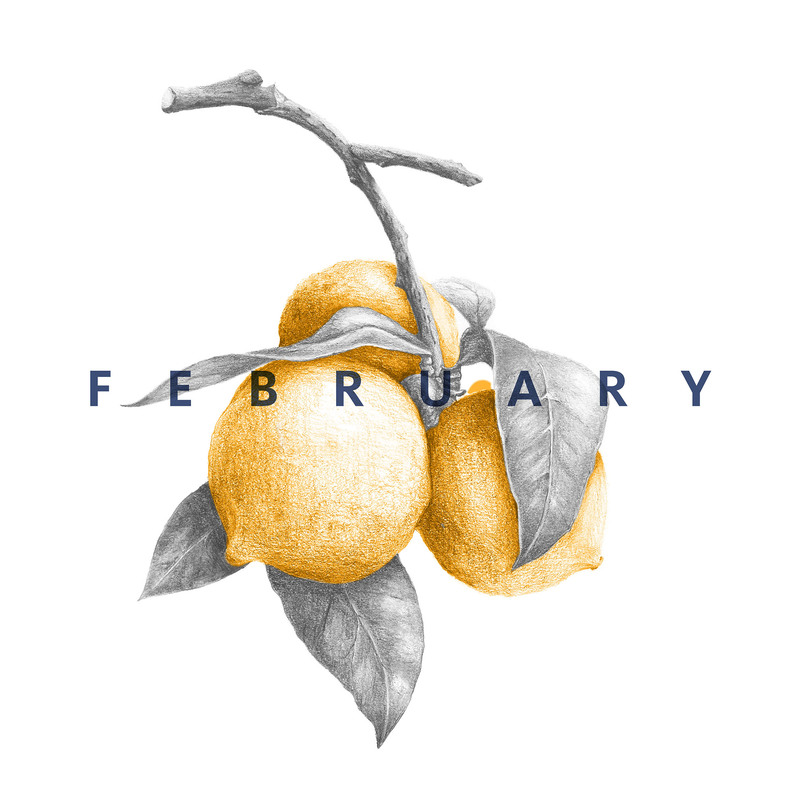 As I reflected more on the coming year I also could not help but be grateful for for my little group of blogging friends who have joined me on this journey of eating well by eating whats in season. 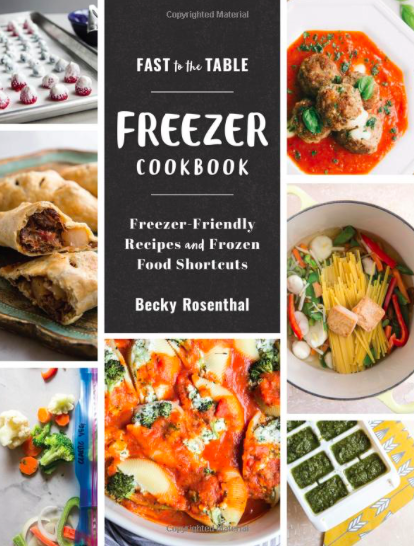 Each one of these bloggers has inspired and encouraged me personally and nutritionally. I hope you can be inspired too. Here are all of our seasonal recipes for this month. 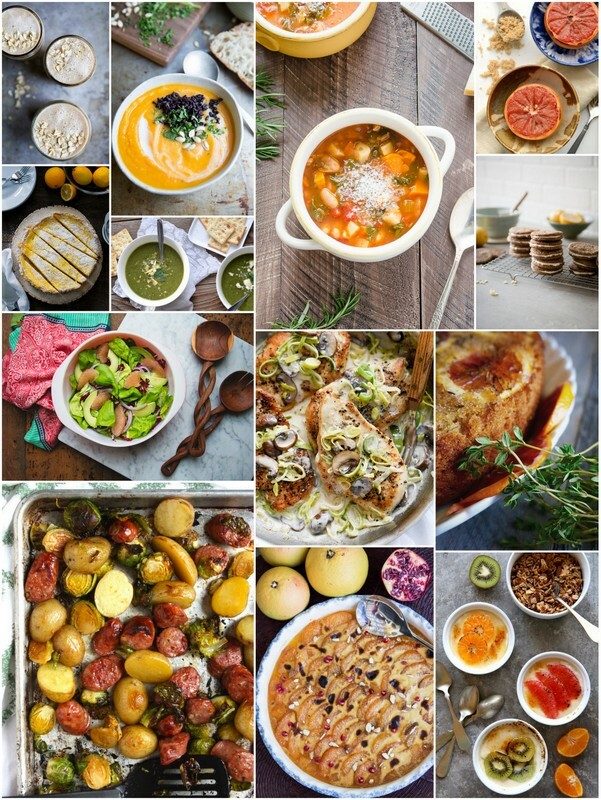 Stay tuned every month as we share our best seasonal recipes around the web. This recipe is inspired by a soup I enjoyed at the Solitude Yurt. 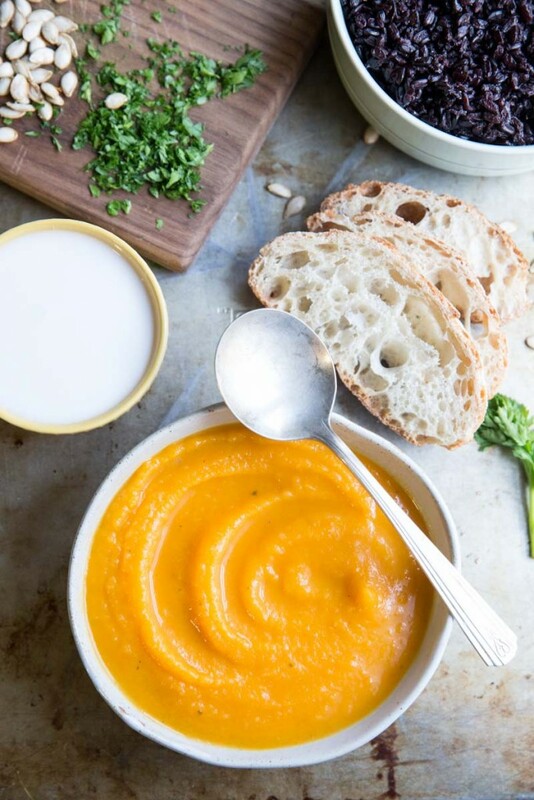 This Butternut Squash, Carrot and Orange Soup is a bowl of sunshine to enjoy mid winter and perfect to enjoy as a cleansing meal for the New Year. Remove top stem and bottom of the butternut squash then peel. Slice the squash in half vertically then, remove seeds and stringy insides. Slice squash into 1 inch squares. Wash and peel the carrots then slice into 1 inch discs. Heat olive oil in a large soup pot over medium heat. Add the diced onion and sauté for 3-4 minutes or until translucent. Add in the squash and carrots. Cook, stirring occasionally for 5-8 minutes or until veggies start to stick to the bottom. Add in broth and bring to a boil. Use a wooden spoon to stir and scrape up any bits that are stuck to the bottom of the pan. Turn the heat down to a simmer and partially cover. 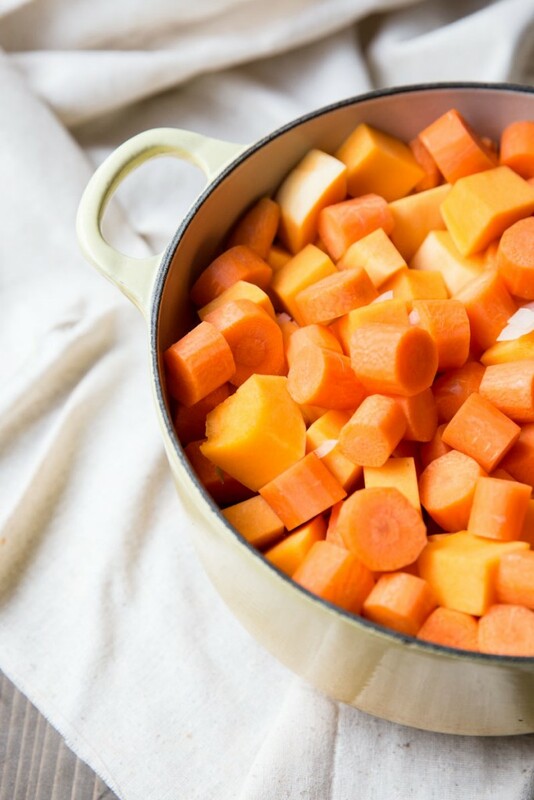 Cook for 34-40 minutes or until squash and carrots are soft. Use an immersion blender to puree the soup until its smooth. Or let the soup cool then puree in a blender. Stir in the coconut milk, orange juice, zest, and seasonings. Adjust seasoning to your preference. Serve hot. 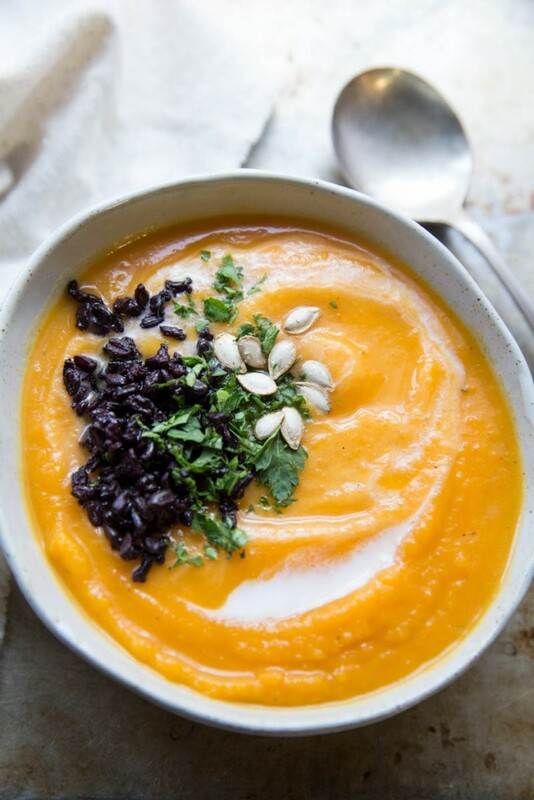 I served this with extra coconut milk, black rice, toasted squash seeds and chopped parsley. Feel free to top the soup with whatever you have on hand - rice, quinoa, nuts, seeds, herbs etc! I’m absolutely trying this recipe! And I love forbidden rice, too! It’s so tasty. I choose a word to focus on each year as well! I love your choice of “joy!” Mine is “cultivate” this year. 🙂 Thanks for #eatseasonal! Ohhh cultivate!! I love that! I want to hear more about what you hope that to look like! I would gladly swim in this beautiful bowl of soup! And I am with you on 2016 being a year of JOY! It is funny that we eat better when we exercise — I know I’m pretty particular about where my calories are coming from. It’s got to be worth it! 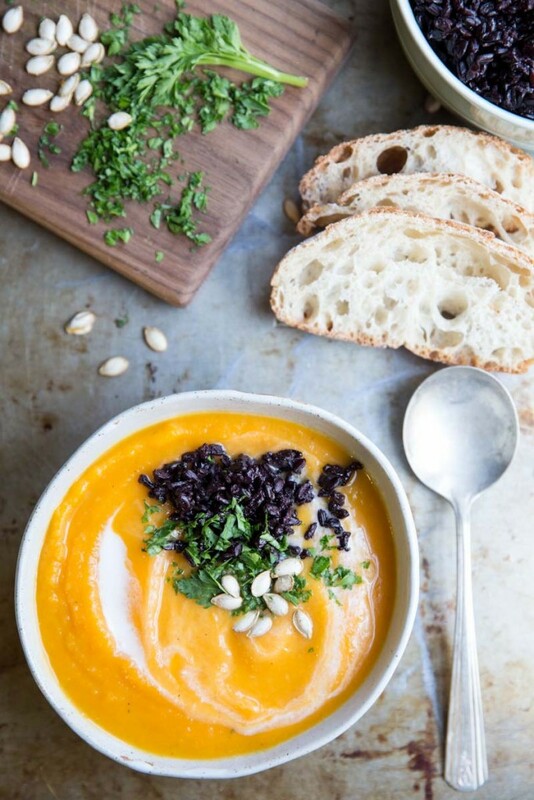 This soup looks velvety smooth and I love that you topped it with black rice — I just love it! Gorgeous bowl of soup, Becky, and thank you so much for hosting another great month! So many great flavors in this soup. I love that there’s coconut milk. Definitely trying this! Hope you like it Annalise!! The added touch of orange makes it nice and different too. 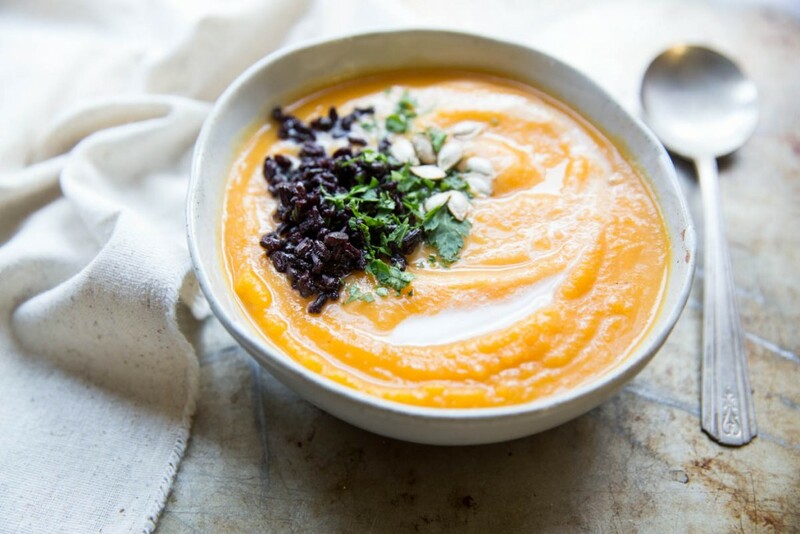 I’m all about any Butternut Squash Soup but this one is really something special! Hooray for a year of JOY! I love that. It’s such a perfect word for 2016! This soup is full of all my favorite things. And the contrast of the forbidden rice on top is just gorgeous! Love forbidden rice–and what a great way to add texture to a creamy soup. My 2016 word is “flow.” As in go with the flow–take the oars out of the water and don’t fight the current–flow with it. I love your word for 2016 – this beautiful soup would truly bring joy! Now you have me thinking about what to choose for mine. I might choose “intent.” I want to be more intentional in everything I do, both personally and professionally. Forbidden rice is one of my all time faves. I love the color and the nutty flavor. I’ll have to try dolloping it on top of soup! Such a great idea. I love your word for the year! And that rice is stunning! I’m going to have to track some down. 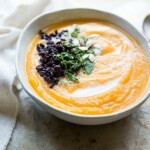 I love how the vibrant orange soup – so thick and creamy, too – is contrasted by the black rice. It’s such a lovely combination. Looks delicious! Do you think you could use regular milk or a different non dairy milk like soy? Rachel, I think dairy milk would be fine or half and half if you want it to be more creamy. I haven’t used soy milk in soup before so I don’t know about that one.